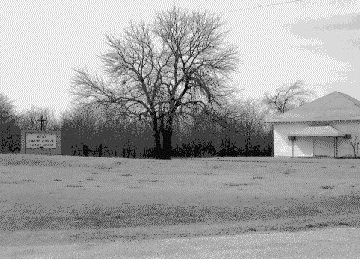 This cemetery is at the Fannin, Collin, and Grayson County lines about about 1 mile east of the blinking light at the intersection of SH 160 and SH 121 in the Desert community. The church and cemetery are at a northwest angle from the road, making them almost invisible from SH 121 when you are heading east. 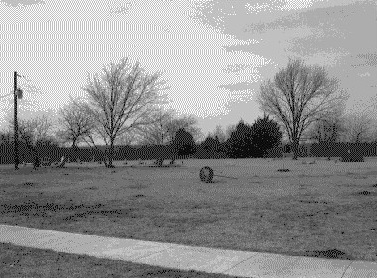 The cemetery covers about 1 acre. There are relatively few graves for that much space. The church and cemetery are active. They are well maintained. This cemetery is connected with the West Shady Grove Baptist Church. The church was started in 1891 in the Gentry School house. I do not know if it was in Collin County. In June of 1900 the congregation had enough money and pledges to construct a church building. The land was given for the church and cemetery by John Gentry in December of 1900. The deed is listed in Vol 52, p 286, and is for 2 acres. It says to go from the Fannin County line, north to the Grayson County line, then west along the Grayson County line so many yards, etc. There is an East Shady Grove Cemetery about 5 miles inside Fannin County, just west of Leonard. COLLIN COUNTY CEMETERY INSCRIPTIONS I made a mistake on the location of this cemetery. They listed it in the Murphy area. They later corrected the error.